Note: This ship can ONLY be used by GMs. 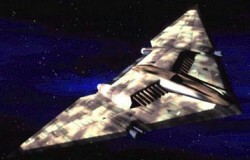 Description: The Raider Fighter is actually an old Narn design, like much of the Raider arsenal. It was phased out of Narn service a long time ago, but the Raiders were able to buy some of the remaining ones. This Fighter was designed to be capable of both space and atmospheric flight, but due to its design it is no match for space-only designs, like the Starfury, in space combat. The raider light fighter can ONLY be used by the GMs. 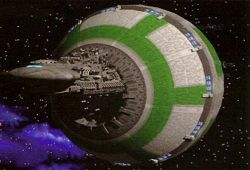 Description: Defense Satellites are totally automated weapons that are used to defend a players' system. The Missle Launchers each hold 10 missles. Each launcher can fire one missle per turn. Note: Only 12 of these may be purchased for each system.